Why cram a tank with all the brightest fish you can find? We visit a reader who uses subtlety to create an intoxicating set-up. Nick Ridout is a man who makes the simple look divine. He believes that what you can save in setting up can be reinvested in quality fish. He also has a gift for making authentic looking layouts with minimal fuss. A common mistake for newcomers, as well as quite a few old hands, is just to keep adding things to a tank in the hope it’ll improve it. If a tank is lacking that certain ‘pizazz’ then it’s easy to assume that a handful of extra fish or decor will fix it. But aquarists might end up with a medley of confused themes. All too often, having too much going on in a tank can be its downfall. That’s not an issue to Wiltshire based Nick. He learnt long ago to keep his decor choice narrow, and his fish selection tight. Resourcefulness is his gift, picking up on wood that most of us wouldn’t even notice, and making the most of it. Coral red pencilfish, Nannostomus mortenthaleri. Nick was introduced to me by a friend, who flagged some of his images online. As a man who sifts through a lot of aquarium photos, what I saw impressed me on two levels. Firstly, it just looked so damned natural. Secondly, the dashes of colour I saw swimming about were a firm personal favourite — Coral red pencilfish, Nannostomus mortenthaleri. I steeled myself for a seven-hour round road trip and called up the photographer. It was a journey worth making. As settings go, Nick’s fish house couldn’t be better sited. Our arrival was marked by the clucks and whinnies of chickens and horses greeting us to an idyllic landscape; a welcome reprieve from our long haul on the road. I even saw my first bee of the year. But we hadn’t come to discuss feathers or hair; we were here for fins. After a quick overview of the terrain, we went into the glowing mouth of Nick’s fish house — a 15-tank, man-made paradise of catfish and other South American delights. Sat there in the middle, beaming from a shelf and sandwiched between two other tanks was the raison d’etre for my excursion — the pencilfish tank. If I call it a pencilfish tank alone then I do it an injustice. There’s a mixture of species living inside, made up from a blend of some lesser seen, to some so common that they border on the mundane. But don’t think the mundane is a bad thing. Here, their presence is used to full effect in adding a lurking, wilderness feel to Nick’s display. They’re the surprise element — a wildcard that work a million times better than I ever expected. Starting with the biggest, there are Nick’s eight Guianacara cichlids, which he purchased from Tropical Amazonas. He calls them Guianacara sp. ‘Red spot’, and unravelling the true identity is a little shakier. My own money is on the fish being Guianacara sphenozona ‘Rio Sipaliwini’, but I’m sure there are others who’d argue a different name. Guianacara is a small genus of fish, and unique to the Guiana Shield of South America. As an area only recently undergoing taxonomic exploration, it’s one of the new discovery hotspots of Latin America. 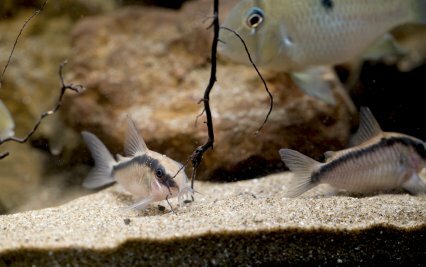 Staying on the bottom of the tank, the cichlids are joined by a shoal of seven Skunk corys, Corydoras arcuatus. With beige base colours and bold, black markings, they perfectly accompany the larger fish, and fit excellently into the shadowy theme. Head and tail light tetra, Hemigrammus ocellifer. Higher up, almost cryptic as they lurk in root tangles are Nick’s 30 Head and tail light tetra, Hemigrammus ocellifer. Despite usually being a tank filler, these turn out to be one of the star attractions, and though they are easily overlooked as 'drab' when sat in stores, here the piercing beacon bright eyes — the very eyes that give them the alternative name of Beacon tetra — cut through the dense network of the wood in a way that adds a sense of mystery and urgency. The tiny flashes are almost exigent for your attention. The genius of adding them is for their price and hardiness. Because they are cheap and resilient, they’re a safe foundation for tanks like this, and a little money can be used to fill a big void. Throw in a good measure of peacefulness in a community, and suddenly I’m looking at Beacons in a whole new (head and tail) light. Still, even the Beacons' charms can’t match the brazenly ostentatious colours of the Coral red pencils. Nannostomus mortenthaleri bring fieriness to the aquarium, and a dozen of them patrol the wood, picking at morsels and periodically flaring at each other in a show of authority. Of all the fish here, they rank as the most pugnacious (and to call a pencilfish pugnacious is a desperate move). Though they chase each other and resolve territorial disputes between themselves, they remain oblivious to their tank mates. As a fish selection goes, this has to be the most harmonious tank I’ve seen in a long while. All credit goes to Nick for creating such a peaceful visual feast. "I had no inspiration as such," Nick says, as I stand hypnotised by the display. "Just a desire to put a tank together that had a meaning of scale. By that I mean nothing in the tank was to look out of place. "The Guianacara were to be my main focus point. I did as much research as humanly possible as to what their natural habitat would be like. Leaf matter, light flow and thin twigs/branches were among the things on my list to achieve for this tank. I’ve always wanted to use tree roots in a tank and this was my perfect excuse." 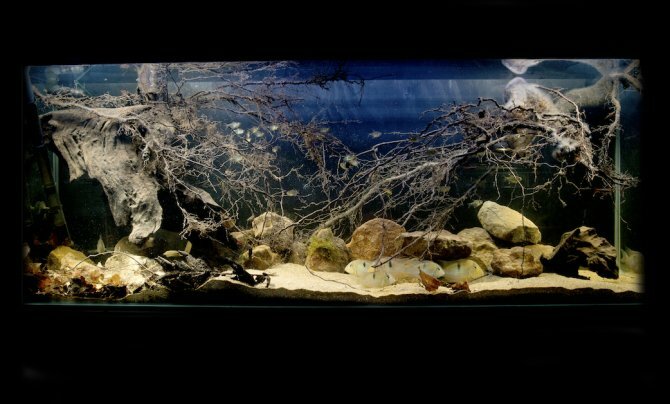 The tree roots play a major role in the aquarium’s visual success, and even Nick concedes that they’ve been the making of the tank. He’s a firm believer in using locally foraged wood, and all of his set-ups incorporate something that has been gathered within a tight radius. The decor for the Guinacara display cost him around £10, and a four-hour walk through nearby woodlands. While on a group scavenge with friends he stumbled across an Oak tree that had fallen and lay drying out for a good eight months. Nick has a background in carpentry, so assessing the dryness and suitability of the wood was straightforward. "Use what’s around you," he says. "But get permission before you go foraging, and do your research on trees. Not all of them can be used in tanks, and it’s only hardwoods that you want to try." He’s picky about which woods to use, too. "I avoid apple or cherry wood, because it doesn’t have that South American aesthetic," he says. Usually when using wood like this, Nick will cut the piece he wants to shape, and put it to one side for three or four months. Aside the Oak roots, he also used some local sandstone, and leaves in this layout — again collected from the local woods. The sand came at a cost of pennies. "The sand’s been working well," he says, "and I bought a ton of it for work for £45. It’s just general sand from a local builder’s merchant." He has an unorthodox way of adding the sand that works for him and helps avoid clouding. Once he’s washed it, he’ll put it into an old soft drink bottle, submerge it and let it fill with tank water, and then gently pour the sand out close to the base, just like he’s pouring a liquid. "Don’t think that a nice tank has to cost the earth," he says. "The decor in this set up has cost me no more than £10. The cost of the fish is a different story..."
The tank started life as biotope, but after a lot of research, Nick added fish that suited the layout best. I ask him how he would class his creation. There are strong elements of biotope, but the fish selection seems at odds with that. "I wanted the set up to be a biotope tank to begin with,” he says. "But with time, the tank just needed that something else. I took my time in researching fish but again I had to add fish that suited the layout best — in my eyes anyway." The proportions are large enough at 120 x 45 x 30cm/48 x 15 x 12in, but perhaps it’s the density of decor that makes it appear smaller. Equipment is basic, and Nick uses a bog standard, off the shelf Eheim 2026 external canister with basic Eheim foam and sintered glass media. Shop online for a secondhand model, and you might find one around the £75 mark. Heating is provided by a single (well hidden) 200W Sera heater that will set you back around £20. A curious factor adding a sense of scale is the way that Nick has restricted the light. In absence of live plants, Nick can go for atmospheric illumination over high intensity, and he’s opted for a 90cm/3ft Arcadia LED, giving a 15cm/6in gloomier gradient at each end of the tank. Combined with a little surface movement, the lights create a rippling effect that our photographs fail to convey. Know that the lighting is pleasing on the eye. Setting up was easy enough, once hardscape had been sourced. "I had the filter running on another tank for months beforehand to help with the set up," Nick says. "I used 60% of the water from another tank to help start it off, with 40% new water added. This was the left for a week or so while I put the finishing touches to the tank. Each species was then bought over a period of four months or so." The tetras look amazing in Nick's set-up. Water chemistry is understandably soft and acidic, though Nick has avoided adding heavy tannins that discolour the water. Using rainwater collected in butts, his weekly water changes of 40% keep the water at an acidic pH6.4, with a TDS reading somewhere between 150–190ppm. On the back of these conditions, the fish have even been through a little breeding activity. "The Guianacara have spawned three or four times now," Nick says, "but I think someone within the tank is eating the eggs." To date, not one of these has made it to adulthood. Asked about what he’d change if starting afresh, Nick has just a few minor amendments. "The tank would be bigger," he says, "and it would have a lot more roots in it. I’d probably change the rocks and add some floating plants too. "And what don’t I like about the set-up? That it’s not in my front room at home so I can just sit and stare at it." As I finally pull myself away from it, leaving his stunning, standard tetras looking at their absolute peak, I confess that I know how he feels. I’m upset it’s not in my front room, either.